WAIST HIGH: The Factory Manchester Opens Tonight. The Factory Manchester Opens Tonight. 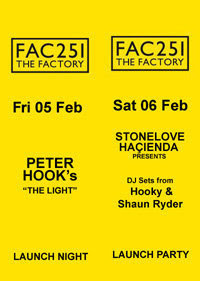 "FAC251 Factory Manchester - The Head office of FACTORY COMMUNICATIONS Ltd, Built by Tony Wilson, Designed by Ben Kelly & Peter Saville, Paid for by New Order, Broken by the Happy Mondays.... "
All OPENING WEEKEND information can be found here.